No, I'm not in high school. And no, I'm not pretending to be a high school student to get cheap season passes at Midwest ski resorts. That just wouldn't be honest. 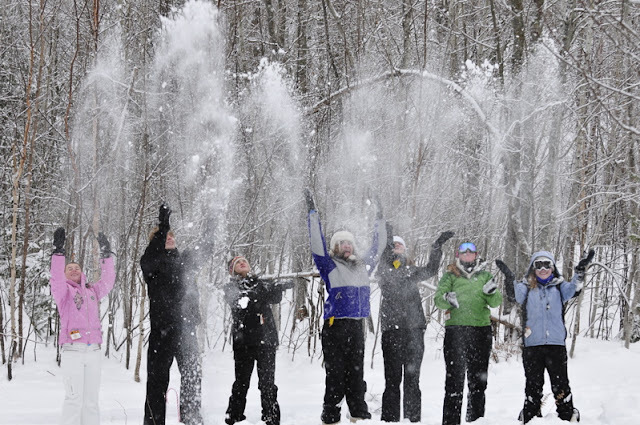 So what's the deal with me going on a high school ski trip? It's all part of a hard [five] day's work. 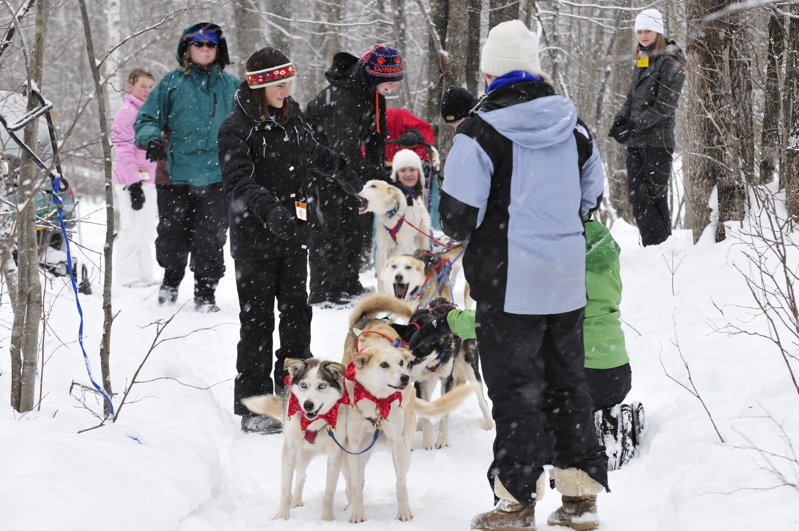 Through my work at the McGaw YMCA in Evanston, I helped plan a five day winter adventure to Michigan's Upper Peninsula for some skiing, snowshoeing, dogsledding, and general winter fun. This was the first time the trip had been offered, so I was happy to have six participants signed up and excited to explore the UP. I wish I could say we did more, but the UP is a long way from Chicago. Marquette, Michigan was our destination and it took a solid eight hours of driving to get there. Luckily I was splitting the driving with two other Camp Echo guides (Mo and Christie) and the roads were nice and dry. Our ski destination was Marquette Mountain. 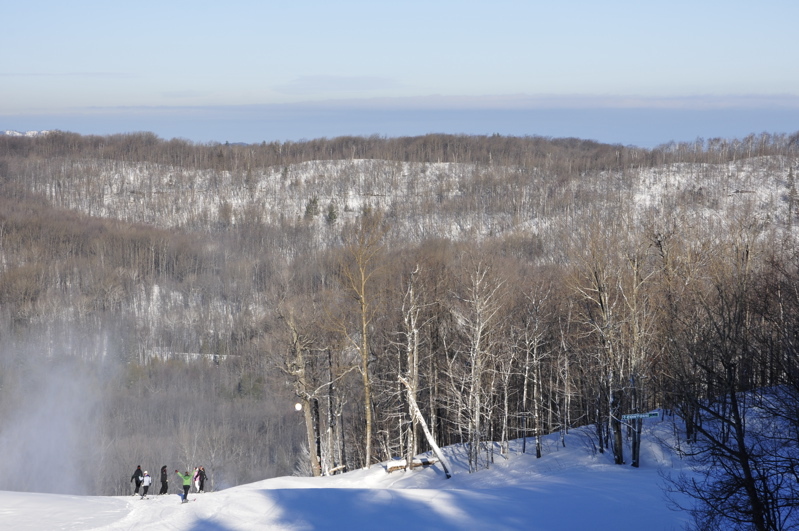 It's a solid Midwest mountain with an impressive 600 feet of vertical. And did I mention the great views of Lake Superior? It may not be Tahoe blue, but it's a pretty sweet lake nonetheless. 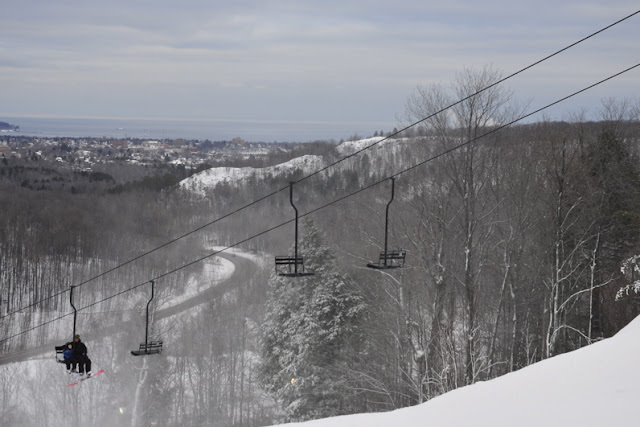 Marquette had gotten a few big dumps and was cranking the snow machines as much as possible to get their 25 runs open. I think there were a few still closed when we got there, but there was a lot of good stuff open. High speed quads? Well, there aren't any quads but there are some pretty quick doubles. 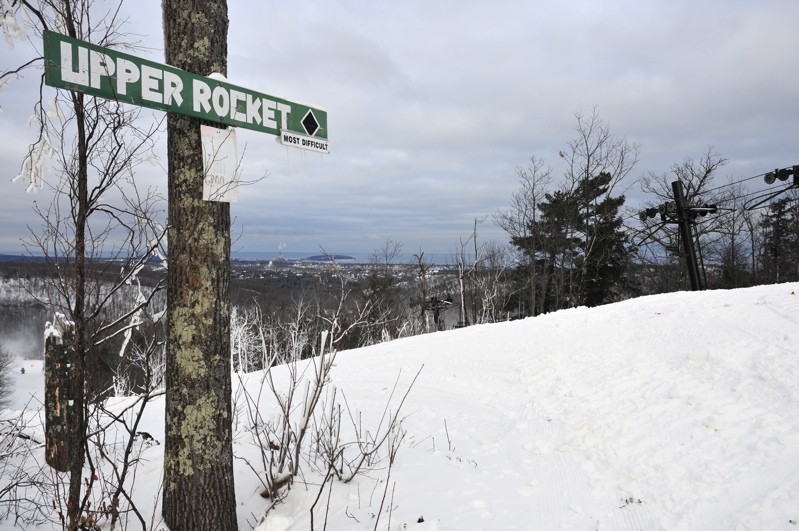 Upper Rocket. Definitely the most difficult run open. But, as they say, it's all relative. Day two of skiing was great. Local schools were still in session and skiers were far and few between. Lift lines? Nope, didn't see any of those either. Even this is nothing like skiing out west, it was a blast to be back out on the slopes, making turns, and dropping knees. Did I mention the views of Lake Superior? Oh, right, I did. They were some nice views. This was the big day. Dogsledding in the morning. Snowshoeing in the afternoon. 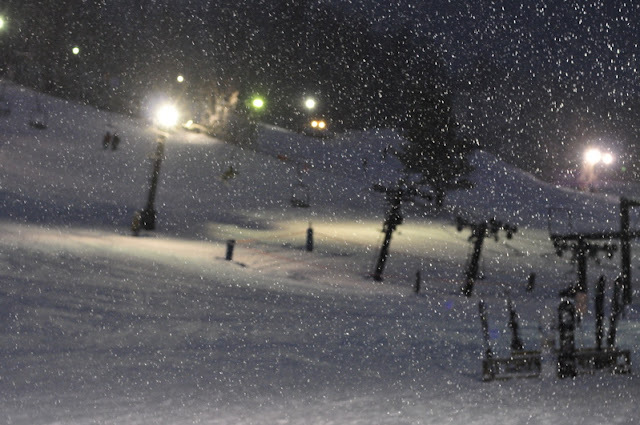 Skiing in the evening. 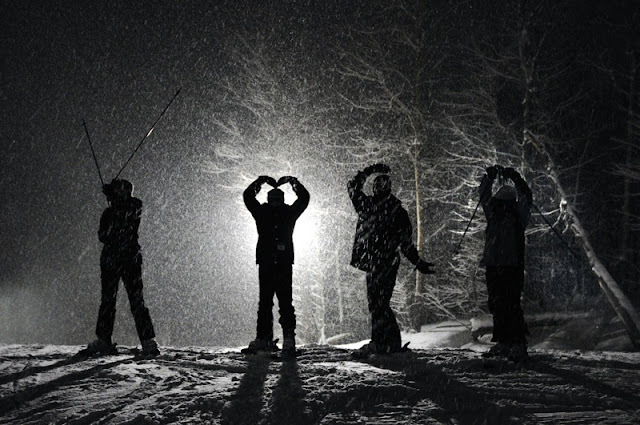 Truthfully, the night skiing wasn't 100 percent part of the game plan, but the kids really wanted to do it and it sounded like fun. Why not? The dogsledding and snowshoeing all went down at Snowy Plains Kennel (I promise I didn't steal my banner font from them - quite the coincidence). 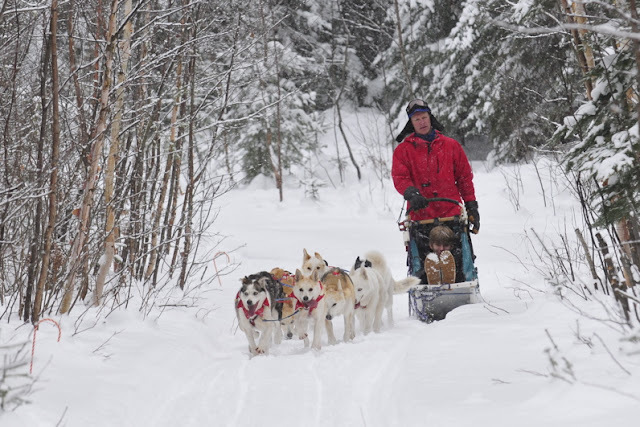 The kennel is run by an incredibly friendly couple, Jim and Jackie, who take groups and individuals on sled rides as more of a hobby than a job. They share great information and stories about raising their 20+ dogs and happily answered all the questions we could throw their way. Being a day of such epic snowy fun, I have included an epic number of snowy photos. 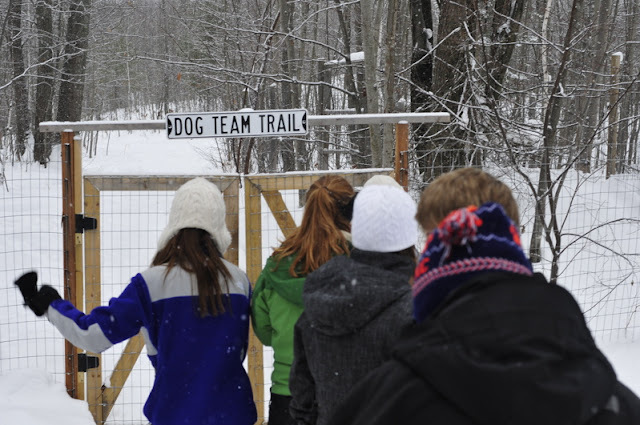 There should be more "Dog Team Trail" signs and less "Snow Machine Crossing" signs. 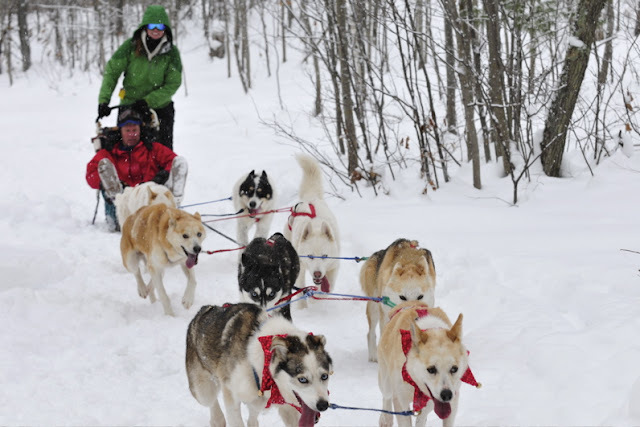 No, that's not Dancer, or Prancer, but those dogs could sure pull a sleigh. Sometimes the snow comes down. Sometimes the snow goes up. Jim did most of the driving, especially with the 8-dog teams. Yet, somehow Christie managed to find her way into the driver's seat for the end of her ride. Where's the sled? No sled needed if you got a few sticks on your feet. Skijoring is my new sport of choice. It was incredible. But don't think I wasn't working. This was a true team effort. 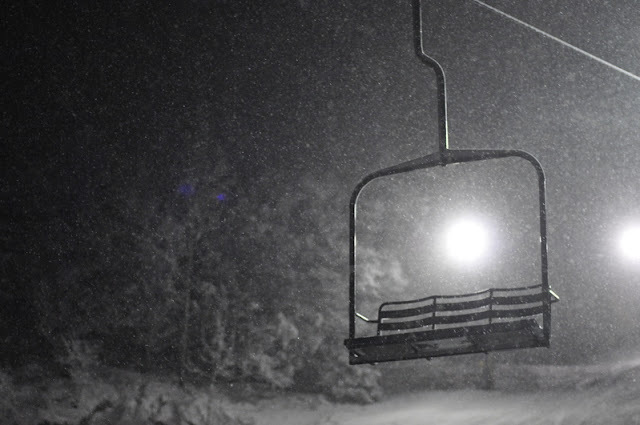 It had been snowing all day by the time we hit Marquette Mountain for their first night of skiing for the season. Still no lift lines and a lot of fun fresh snow. I'm going to get used to this whole night skiing thing. A beautiful winter YMCA to close the night. Though it was over before we knew it, and we were faced with another long eight hours on the road, it would be hard to say that this trip didn't have it all. Three full days of fun. I can't wait to return to explore the area more on my own, but also to return with another high school group. Next time we're bringing a full bus! 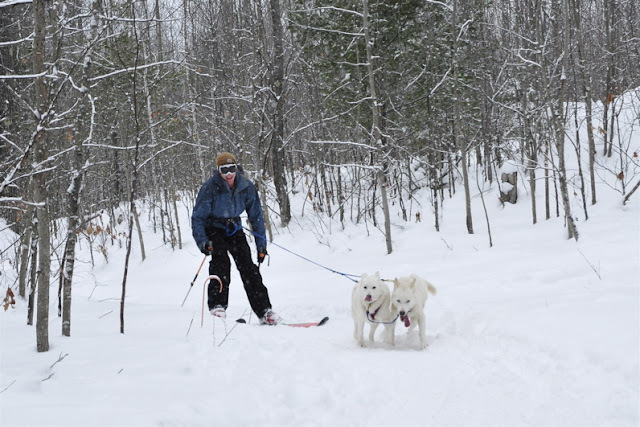 Marquette Ski Trip from Bernard Rocca on Vimeo.